89 records – page 1 of 2. 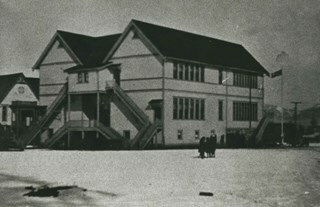 Photograph of children standing outside of Kingway West School (originally named West Burnaby School). The children at the front are holding a Union Jack and the school cheer is written in front of them, "Rim-a-lic, Zim-a-lic / Boom alac-aday / Kingsway West, Kingsway West / Hurrah! Hurrah! Hurrah!" A boy and two girls are each holding a trophy. Photograph of the staff at Kingsway West School (originally named West Burnaby School) standing in front of the school building. The teachers are (from the left); Miss Brice, unidentified (at the back), Miss Annie Forrest, Miss Morrow (at the back), unidentified, Miss Gray (in profile) and Mr. Brown. 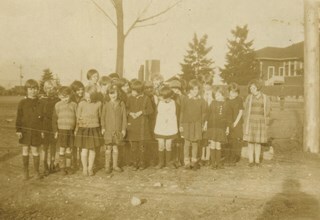 A group of children is standing to the left behind them. Photograph of a West Burnaby School (later renamed Kingsway West School) class standing outside of the school. Identified, back row, left to right: [unidentified], Georgina Bell, [first name unknown] Creamer, Gladys Bisset, Bernadette McNeil, Elsie Wilson, and Mabel Rowlinson. 2nd row, 5th from left: Edith Marten. 3rd row, left to right: [first name unknown] McMaster, [unidentified], Jean Ross, [unidentified], Goldie Ralph, Mabel Ralph, Grace Marten, [3 unidentified children], Lois Rumble (later Wilson), [unidentified], and George Robertson. 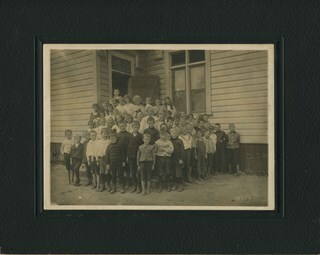 From row, left to right, starting at 7th child: Wilson Bailey, [first name unknown] Bond, [2 unidentified children], Bill Smith, Elgin Robertson, [2 unidentified children], Gordon Bailey, [2 unidentified children], [first name unknown] Bramble. The teacher, standing at the back left, is Miss Annie Theresa Forrest. 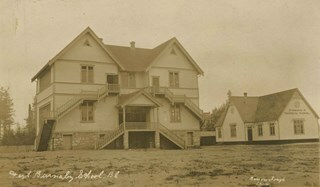 1 photograph : b&w postcard ; 7.5 x 13 cm + 1 p.
Photographic postcard of Division II at West Burnaby School (later renamed Kingsway West School) sitting and standing outside. Standing in the back row third from the left is Lillian Bond, beside her is [first name unknown] Barber, Eva Coburne, Mabel Ralph, [first name unknown] Bramble, George Robertson, Mabel Rowlinson, unidentified, Georgina Bell, Bright Robertson and Fred Bond. Fourth from the left in the second row is Glen McMaster, sixth is Lois Rumble (later Wilson), beside her is Margaret Creamer, Gladys Bisset, Amy Sandell, unidentified, Elgin Robertson, unidentified and Bill Smith. Sitting in the front row, third from the left is Goldie Ralph, beside her is Edith Marten, unidentified, Jessie Robertson, [first name unknown] McMaster, Grace Marten, Elsie Wilson, Beatrice Barber, Dora Barber, Jean Ross and Dolly Smith. John Robertson is sitting on the ground, on the far left and Miss Annie Theresa Forrest is standing on the far left behind her students (next to her is a bicycle). Printed by photographer on recto of photograph: "2nd Div. West Burnaby School / Barrowclough Cards"
1 page accompanying lists the individuals in the photograph as: "Back row, l to r: 3rd, Lillian Bond; 4th, [first name unknown] Barber; 5th, Eva Coburne; 6th, Mabel Ralph; 7th, [first name unknown] Bramble; 8th, George Robertson; 10th, Mabel Rowlinson; 12th, Georgina Bell; 13th Bright Robertson; and 14th, Fred Bond. Second row, l to r: 4th, Glen McMaster; 6th, Lois Rumble; 7th, Margaret Creamer; 8th, Gladys Bisset; 9th, Amy Sandell; 11th, Elgin Robertson; and 13th, Bill Smith. First row, l to r: 3rd, Goldie Ralph; 4th, Edith Marten; 6th, Jessie Robertson; 7th, [first name unknown] McMaster; 8th, Grace Marten; 9th, Elsie Wilson; 10th, Beatrice Barber; 11th, Dora Barber; 12th, Jean Ross; and 13th, Dolly Smith. Seated on ground, left to right: 1st, John Robertson." 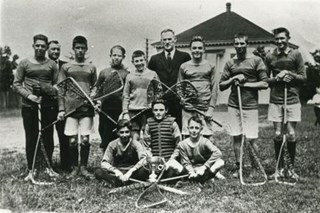 Photograph of Kingsway West School lacrosse team. Thomas "Tom" Chalmers is 3rd from left. The Burnaby School Board office is visible in the background. Photograph of Kingsway West School class. Thomas "Tom" Chalmers is at the far left of the back row. 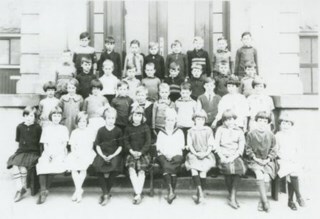 Photograph of Kingsway West School grade four class sitting and standing in four rows in front of the school steps. 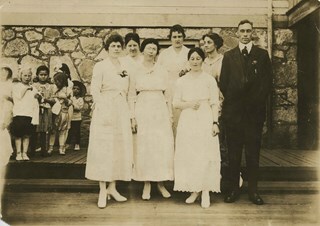 Elaine A. Myers is standing in the second row, second from the left, in a flowered dress. Photograph of the Kingsway West School choir. Identified: (1st row, 7th from left) Laura Brown (later, Laura Francescini). She was one of eight Brown sisters, daughters of Ed Brown and Jane Brown (nee Birtch). 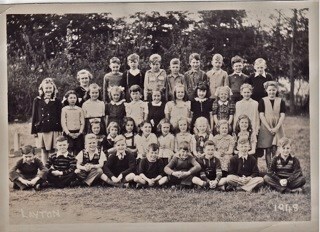 Also identified is Florence Irene Lomas, in the third row from bottom, second person in from the left. 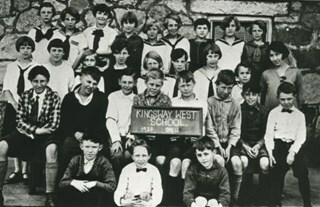 Photograph of Division IX class, Kingsway West School. Identified: (back row, 7th from left) Laura Brown (later Laura Francescini), one of eight Brown sisters, daughters of Ed Brown and Jane Brown (nee Jane Birtch); and Florence Irene Lomas (back row, third in from left side). Teacher: Miss Black. Photograph of Kingsway West School teaching staff outside on the school grounds. 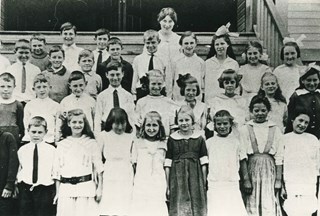 Back row, left to right: Mr. William D. Blair (principal), Miss M. Bloomfield, Miss Annie Theresa Forrest (much loved by generations of younger children in her Grade 1 class), Miss Edith Kay, Miss Daisy Bodley, Miss Bert Thompson, Mr. William Wallace (vice principal), Miss Morgan, Miss Grimwood, Miss Doris Scott, and Mr. George Sievers. Front row, left to right: Mrs. Cassie Roberts, Miss Dorothy Black, Miss Christine Goodman, and Miss Rose Mould. Margaret Gooding was absent. 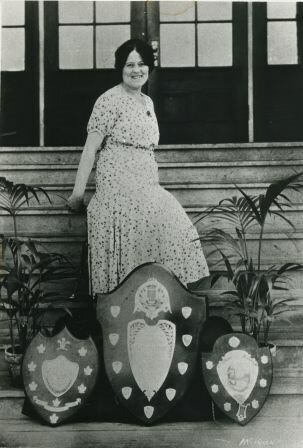 Photograph of Miss Rose Mould, long-time Kingsway West School music teacher with shields won in musical competitions. 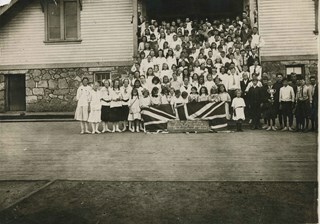 Photograph of the West Burnaby School class, including teachers, lined up in rows on the porch steps, with the first row seated on the ground with their feet crossed in front of them. Individuals that have been identified, in pencil, directly on the photograph include; Teacher Lili Lawson (far left), Lily Main (two over from Lawson), Ethel Smith (far left in the back row), and Headmaster Samuel Shepard (far right in the back row). 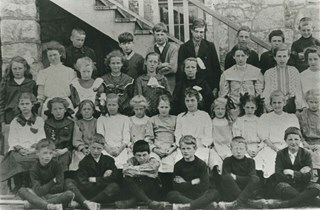 Members of the Patterson family are also in this photograph; William (Bill) is sitting in the front row, third from the left, Bruce is sitting two to the right of Bill, with Alice two rows directly behind Bruce (her hair is shorter than the other girls and she is wearing a dark shirt), with their older sister Mary standing two rows directly behind Alice. The school was later renamed Kingsway West School and remained in operations until 1952. 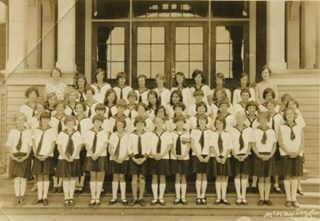 Photograph of Division 14 at Kingsway West School standing in four rows on the front steps of the school building with their teacher (Miss) Annie Forrest (standing to the right). The student are, top row (l to r); Alfred Peacock, Al Harris, Howard Griffiths, Alfred Younger, Jack Pickwell, Gordon Oldaker, Harvey Knorr, Jimmy King, James Fraser, Austin Pelton and Robert Ferguson. Second row; Donald McKinnon, Wallace MacMillan, Bobby Featherstone, George Chamberlain, Lorna Wright Gladys Nuttall, Isabel McFadyen, Theresa Soda, Dorothy Barber, Maria Soda and James Murie. Third row; May Ford, Fila Bourach, Winnie Woodward, Doris Faulkner, Irene Vigar, Kathleen Burchell, Dorothy Guthrie, Peggy Pool, Elsie Brown and Patricia Hodgson. Front row; Margaret Mayhew, Dorothy McKenzie, Mildred Rutledge, Marjorie Jackson, Betty Gold, Priscilla Deane, Verna Crane, Audrey Browne, Lillabelle Moore and Gladys Would. 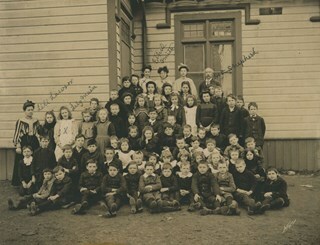 Photograph of Miss Black (top left corner) and her class standing on the stairs (in rows) at Kingsway West School (originally named West Burnaby School). 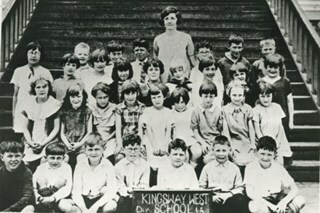 Photograph of Miss Kay (top right corner) and her class standing on the stairs (in rows) at Kingsway West School (originally named West Burnaby School). Photograph of Kingsway West school children standing in group on the school grounds. 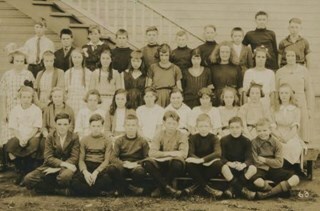 Photograph of a Kingsway West School (originally named West Burnaby School) class sitting and standing in rows outside. The school staircase is visible behind them. Photograph of West Burnaby School students standing outside in front of their school in two long rows, with their teacher and school staff members standing on the right. 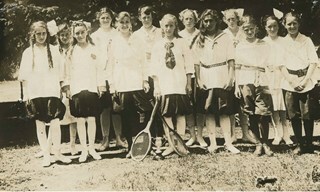 Daisy Birchell is the smallest in the group, standing in the front row, eighth from the left, and her cousin is standing beside her, ninth from the left. The school was later renamed Kingsway West School and remained in operations until 1952. Note in accompanying material states that the photograph is the property of Charles Burchell's family, and "children as pupils" were; William, Frederick, Lily, and Daisy Burchell. 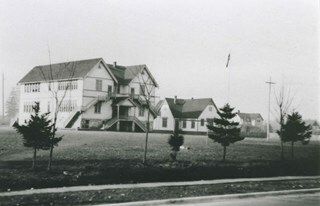 Photograph of the buildings on the West Burnaby (later renamed Kingsway West) School grounds. 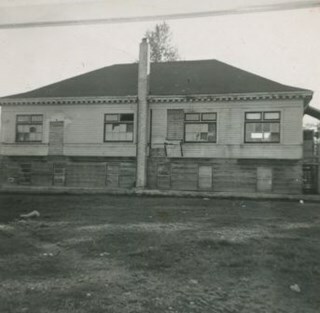 Photograph focusing on the larger building on the West Burnaby (later renamed Kingsway West) School grounds. 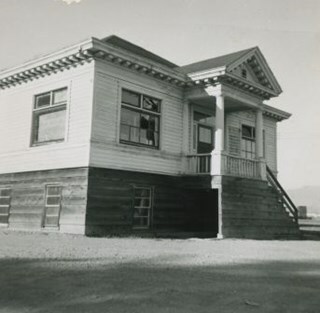 Also included in the photograph are the Manual Training Building and the School Board office. Photograph of Gwen Pitman sitting in a chair, smiling. She is inside the Burnaby South High School gym for the Kingsway West (originally named West Burnaby) School reunion. 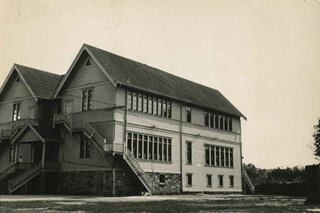 Photograph of the old Kingsway West school building which also served as the Bonsor Hall. Photograph of the Bonsor Hall (formerly the Kingsway West School). A note on the back of the photograph reads: "The Old Bonsor Hall - Formerly Kingsway W. School as in Burnaby Courier." The photograph was taken by the Burnaby Courier newspaper ca. 1958. 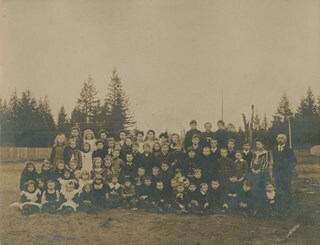 Photograph of the West Burnaby School class, including teachers, on the dirt field next to the school. Eight of the individuals have been identified; sitting in the second row, second from the left is (8) Alice Patterson, standing in the center of the third row is (4) William (Bill) Pattterson, and in the back row on the far left is (7) Mary Patterson, beside her, (6) Lily Main, three from Lily is (5)Ethel Smith, and third from the right in the same row is (3) Bruce Patterson. The school headmaster (1) Samuel Shepard is standing on the far right and standing next to him is their teacher, (2) Lily Smith. The school was later renamed Kingsway West School and remained in operations until 1952. 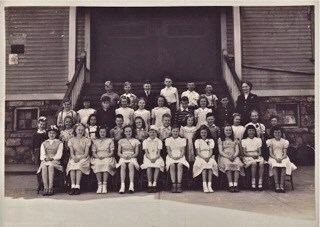 Photograph of Kingsway West school senior grade five class with Sylvia Murley in the second row, third from left. 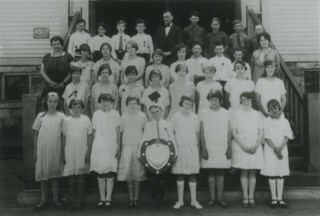 The music festival director Rose Mould (third row, far right) and school principal Mr. Blair (back row, centre) are also pictured (a boy in the front row is holding the shield won by the school choir that year). Photograph of a Kingsway West School class, in front of the school. 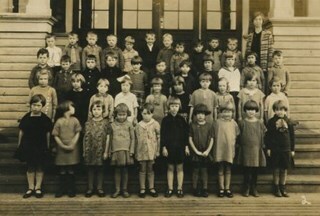 Photograph of a West Burnaby (later renamed Kingsway West) School, Grade 1 class. Their teacher (standing far right) is (Miss) Annie Forrest who taught for over thirty years and was much beloved by many Burnaby children. Standing in the back row (l to r) are: Doris Faulkner, Louise Lister, Bessie McLaren, (first name unknown) Brown, (first name unknown) Brown, unidentified, unidentified, unidentified. Second row: Willie Nixon, unidentified, Catherine Taylor, Eunice Paul, unidentified, unidentified, (first name unknown) Simpson (the boys seated in front two rows have yet to be identified). Photograph of the Grade 7 class at Kingsway West (originally named West Burnaby) School. Edith Crake is the teacher. The students are standing on the steps of the school.There are 20 boys and 12 girls, and Ms. Crake. Accompanying notes partially identify the students. Front row: left to right. 1) Abbey, 2)&3) [unidentified], 4) Gladys Coates, 5) Ina Hart, 6) [unidentified]. Second row: left to right. 7) [unidentified], 8) [first name unknown] Murrey, 9) [first name unknown] Chapple, 10) [first name unknown] Murrey, 11)&12) [unidentified]. Third row: left to right. 13) Edith Crake (teacher), 14) Stewart MacPherson, 15) Bert Price, 16) [unidentified], 17) Gilbert Summers, 18) Alden Tayler, 19) [unidentified]. Fourth row: 20) Harold Lomas, 21) Hugh Silver, 22) [first name unknown] Murrey [? ], 23) [unidentified], 24) Murray Hilton. Fifth row: 25) [unidentified], 26) Bill Logan [? ], 27) [unidentified], 28) George Main. 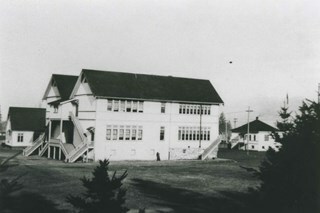 An annotation at the bottom of the original photograph reads, "Kingsway West School, Burnaby, B.C." Aerial photograph of the aftermath of the Save-on-Foods roof collapse at Metrotown on April 23, 1988. The rooftop parking lot has caved into the store along with the cars parked in that section. Workmen and police officers in uniforms are at the parking lot. 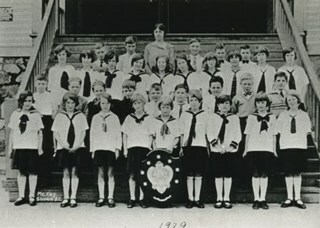 Photograph of Division IX at Kingsway West School standing in three rows on the front steps to the school. The students are; top row (l to r): Billy Turner, John Ward, Reginald Stalker, George Russell, David Amos, Bernard Dermott, Owen Mills, John Harding, Freddy Eaglestone, Jack Dalziel and Jack Rohins. Middle row: Charles Nixon, Alex Lester, Vernon Ardagh, Lester Beech, Margaret Guthrie, Hazel King, Thelma Geocott, Richard Glassman, Arthur Hope, Willie Hill, John Derwick, Ian Cameron and Matthew Summerfield. Bottom row: Margaret Dingwall, Kathleen Kennedy, Georgine Stone, Sylvia Wright, Lesley Hill, Mary McLean, Katherine Lawe, Eileen Dodge, Mary Garside, Dorothy Kent and Eileen Collins. Printed on verso of photograph: "Bridgman VANCOUVER"
Note in black ink on verso of photograph reads: "June - 1922. Div. IX Kingsway West./ Top row, Left to right./ Billy Turner, John Ward, Reginald Stalker, George Russell, David Amos, Bernard Dermott, Owen Mills, John Harding, Freddy Eaglestone, Jack Dalziel, Jack Rohins. / Middle Row, - Charles Nixon, Alex Lester, Vernon Ardagh, Lester Beech, Margaret Guthrie, Hazel King, Thelma Geocott, Richard Glassman, Arthur Hope, Willie Hill, John Derwick, Ian Cameron, Matthew Summerfield / Lowest Row, Margaret Dingwall, Kathleen Kennedy, Georgine Stone, Sylvia Wright, Lesley Hill, Mary McLean, Katherine Lawe, Eileen Dodge, Mary Garside, Dorothy Kent, Eileen Collins." 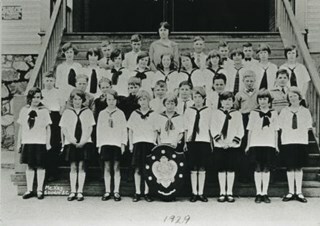 Photograph of Division VII at Kingsway West (originally named West Burnaby) School with eleven boys standing and eleven girls sitting in two rows in front of the school building along with their teacher (Miss) Annie Forest (standing to the right). The students are ; standing (l to r): Reggie Mills, Gordon Bell, Ian MacLeod, Leslie Greenwood, Lionel Brett, Robin Williams, Lawrence Ayres, Clyde Ayles, George Simpier, Leslie Summers and John Harte. Sitting (l to r): Grace Kreamer, Nora Summerfield, Leona Kinnee, Norma Kinnee, Alexina Bellsmith, Dolly Anderson, Winnie Miatt, Eudora Walters, Edith Barivice, Mary Gunzeon and Grace Geddes. Note in black ink on verso of photograph reads: "Aug to December 1914 Div VII Kingsway West. / Left to right Top row. Reggie Mills/ Gordon Bell/ Ian MacLeod/ Leslie Greenwood/ Lionel Brett/ Robin Williams/ Lawrence Ayres/ Clyde Ayles/ George Simpier/ Leslie Summers/ John Harte / Girls - Left to Right./ Grace Kreamer/ Nora Summerfield/ Leona Kinnee/ (Norma Kinnee)/ Alexina Bellsmith/ Dolly Anderson/ Winnie Miatt/ Eudora Walters/ Edith Barivice / Mary Gunzeon/ Grace Geddes." 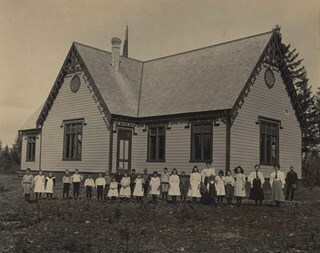 Photograph of a West Burnaby (later renamed Kingsway West) School, Grade 1 class. Their teacher (standing on the left) is (Miss) Annie Forrest who taught for over thirty years and was much beloved by many Burnaby children. Included in the photograph are: Doris Faulkner, Louise Lister, Bessie McLaren, Willie Nixon, Catherine Taylor, and Eunice Paull. 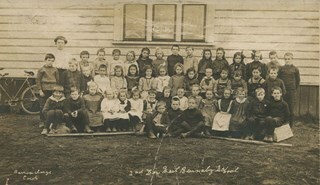 Note in pencil on verso of photograph reads: "a little darker than the finished ones will be"
Note in black ink on verso of photograph reads: "1915 or 1916"
Photograph of Division 13 at Kingsway West School, Grade 1 - B taught by (Miss) Annie Forrest (not pictured). The students are standing in four rows on the front steps of the school building (one side of the front door is swung open behind the group). They are; top row (l to r): Wilfred Lee, Desmond Truscott, Jack Ford, Billy Richardson, Donald Back, George Connor, Harold Yarl, Raymod Zingrick, Lawrence Wentz, Charlie Johnson, Billy Burshell and Gordon Chisholm. Second row; Edna Reid, Barbara Sleeth, Evelyn Chalmers, Mabel Birtch, Donald Davis, Jack Nuttall, Charles Coe, Alan McIntosh, Billie Huestis, Harold Whittam and Charles Higham. Third row; Kathleen Williams, Phyllis Rumble, Nora King, Alice Younger, James Best, Helen Langford, Alice Mumbray, Pearl Rouse, Alex MacDonald, Joseph Soda and John Macmillan. Front row; Peggy McLean, Elinor Burke, Viola Cram, Barbara Wright, Jean Coutts, Vera Kincaide, Doris [illegible], Grace Norland, Eileen Davies, Lovina Phillips, Winsome Summers and Audrey Morash. Note in black ink on verso of photograph reads: "Burnaby B.C. Div. 13. Kingsway West School, Oct. 1925,/ A. J. Forrest (teacher) Grade I-B / Top row. Left to right (12). Wilfred Lee, Desmond Truscott, Jack Ford, Billy Richardson, Donald Back, George Connor, Harold Yarl, Raymod Zingrick, Lawrence Wentz, Charlie Johnson, Billy Burshell, Gordon Chisholm/ 2nd row Lt. to rt. Edna Reid, Barbara Sleeth, Evelyn Chalmers,/ Mabel Birtch, Donald Davies, Jack Nuttall, Charles Coe, Alan McIntosh, Billie Huestis, Harold Whittam, Charles Higham / 3rd row Lt to. rt. Kathleen Williams, Phyllis Rumble, Nora King, Alice Younger, James Best, Helen Langford, Alice Mumbray, Pearl Rouse, Alex MacDonald, Joseph Soda, John Macmillan / 4th row Lt. to rt. Peggy McLean, Elinor Burke, Viola Cram, Barbara Wright, Jean Coutts, Vera Kincaide, Doris [illegible], Grace Norland, Eileen Davies, Lovina Phillips, Winsome Summers and Audrey Morash." Photograph of the teaching staff at Kingsway West School sitting and standing in two rows in front of a fence. Standing in the back row are (l to r); Miss Brice, Miss Morrow, Miss Brawn, Mr. Somerville, Miss Wells, Miss McGowan and Miss Wood. Seated in the front row (l to r); Miss Simpson, Miss Annie Forrest, Mr. Brown, Miss Simmonds and Miss Gray. Photographer's mark on verso of photograph reads: "Bridgman VANCOUVER"
Note in black ink on verso of photograph reads: "June, 1922 / Left to right, Back row Misses Bure, Morrow, Brawn, Mr. Somerville, Misses Wells, McGowan, Wood / Front row. Misses Simpson, Forrest, Mr. Brown Misses Simmonds, Gray"
Note in pencil on verso of photograph reads: "Teaching Staff Kingsway West"
Photograph of Division 14 at Kingsway West School standing and sitting in five rows in front of the school building windows. Two boys sitting in the front row are holding up a chalk board which reads, "Kingsway West School/ Division 14." 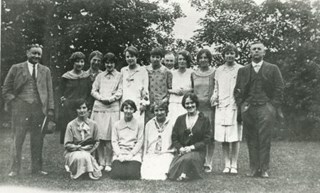 Standing in the top row (l to r) are; Audrey Browne, Joan Gold, Ida Wright, May Ford, Mabel Law, Dorothy Barber, Gladys Would and Isabel McFadyen. In the second row are; Betty Dermott, Maria Soda, Dorothy Guthrie, Pearl Rouse, Norma Moller, Marrion Hickenbotham, Priscilla Deane, Barbara Sleeth and Elsie Brown. In the third row are; Patricia Hodgson, Verna Crane, Gladys Nuttall, Muriel Iraine, Dorothy McKenzie, Doris Faulkner and Mildred Rutledge. Sitting in the fourth row are; James Murie, Bobby Shewan, Donald McKinnon, Howard Griffiths, Henry Nevin and Bobby Ferguson. In the front row are; Harvey Knorr, Alfred Younger, George Chamberlain (holding chalkboard), Ben Jacobson (holding chalkboard), Alex Walker and Garnet Eckard. Stamps on verso of photograph read: "25cents each. Please/ order number paid for" and "H. G. BRYCE, EDMONDS, B.C." Note in black ink on verso of photograph reads: "Div 14. Kingsway W. May, 1927/ Top row - left to right Audrey Browne, Joan Gold, Ida Wright, May Ford, Mabel Law, Dorothy Barber, Gladys Would, Isabel McFadyen / 2nd row lt. to rt. Betty Dermott, Maria Soda, Patricia Hodgson, Dorothy Guthrie, Verna Crane, Pearl Rause, Gladys Nuttal, Norma Moller, Muriel Iraine, Marrion Hickenbotham, Dorothy McKenzie/ 3rd row Doris Faulkner, Barbara Sleeth, Priscilla Deane, Mildred Rutledge, Elsie Brawn, Boys. James Murie, Bobby Shewan, Donald McKinnon, Howard Griffiths, Henry Nevin, Bobby Ferguson/ 2nd row Harvey Knorr, Alfred Younger, George Chamberlain, Ben Jacobson, Alex Walker, Garnet Eckard"
Photograph of students at Kingsway West School standing in four rows on the front steps of the school. 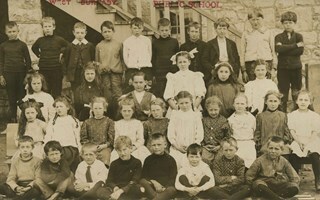 Their teacher, (Miss) Annie Forrest, is wearing a dark jacket over a polka dot shirt (and is standing to the left). The students are; top row (l to r): Harvey Hickenbotham, Bobby Nayes, Kenneth Harding, Allen Sharpe, Douglas Heywood, Frank Gilpin and Frank Fletcher. In the second row; Shirley Stibbs, Grace MacSorley, Edith McDonald, Kenneth Bradley, Robert Houlden, Richard Pickwell, Fred Slaney, Gordon Brawnlie, Eric Bliss, John Matheson and Fraser Robertson. In the third row; Joan Richards, Eileen Uychara, Margaret Douglas, Dorothy Graham, Lois McLeod, Eileen Currie, Edith Frith, Shirley Hamill, Lillian McKenzie, Patricia Peacock and Robert Magee. In the front row; Dorothy Wray, Renee Berg, Kathleen Boyd, Evelyn Webster, Isobel Copland, (Agnes Sollaway or Marion Braniff), Doreen Parks, Wanda Cullen, Rona Smith, Jean Gray, Janet Soda and Mary Webster. Note in pencil on verso of photograph reads: "Left to right 1930-1931 Top row. Harvey Hickenbotham, Bobby Nayes, Kenneth Harding, Allen Sharpe, Douglas Heywood, Frank Gilpin, Frank Fletcher / 2nd row. Shirley Stibbs, Grace MacSouley, Edith McDonald, Kenneth Bradley, Robert Houlden, Richard Pickwell, Fred Slaney, Gordon Brawnlie, Eric Bliss, John Matheson, Fraser Robertson/ 3rd row Joan Richards, Eileen Uychara, Margaret Douglas, Dorothy Graham, Lois McLeod, Eileen Currie, Edith Faith, Shirley Hamil, Lillian McKenzie, Patricia Peacock, Robert Magee / 4th row. 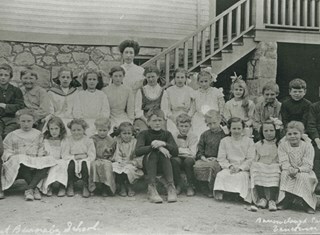 Dorothy Wray, Renee Berg, Kathleen Boyd, Evelyn Webster, Isobel Copland, Agnes Sollaway, Doreen Parks, Wanda Cullen, Rona Smith, Jean Gray, Janet Soda, Mary Webster"
Photograph of students at Kingsway West School standing in three rows on the front steps of the school with their teacher, (Miss) Annie Forrest, crouched behind the top row (on the right). In the top row Richard Pickwell is fifth from the left, with Harvey Hickenbotham sixth, Bobby Nayes seventh, Robert Magee eighth and Eric Bliss last (twelfth). The second row begins on the far left with Fraser Robertson, with Allen Sharpe second and Edith Frith last (twelfth). The front row begins with Janet Soda on the far right, Patricia Peacock fourth, Eileen Uychara sixth, Jean Gray ninth, Dorothy Graham tenth and Grace MacSorley last (twelfth). There is a sign by the stairs that reads, "ANY PERSON HAVING BUSINESS IN THE SCHOOL MUST APPLY TO PRINCIPAL. NO CANVASSING PERMITTED." 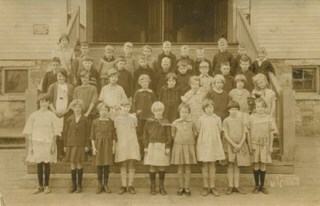 Note in black ink on verso of photograph reads: "1931"
Photograph of a class at Kingsway West School sitting and standing in four rows on the front steps of the school building. The students are: top row (l to r); Harold Coburn, Warren Simpson, Robert Gibson, Jimmy Kirkpatrick and Manwell James. In the second row are; Jean Bruce, Alice Goss, Jean MacDonald, Annabelle Johnson, Cyril Ridal, Howard McDaniel, Gilbert Laird, Harry [illegible], Robert Beck and [illegible] Gray. In the second row are; Terry Kirkpatrick, Sheila McAdam, Lillian Chapman, Lorna Greenwood, Iris Daxbury, Mary Tait, Kathleen Westley, Sabine Stibbs, Margaret Hawthorne and Grace Sutherland. Seated in the front row are; Buddy McCann, Billy Robertson, Stanley Long, Buddy [illegible] and Gordon Blanchard. Note in black ink on verso of photograph reads: "1936 + 7." Note in pencil on verso of photograph reads: "Lt to rt. Top. Harold Coburn, Warren Simpson, Robert Gibson, Jimmy Kirkpatrick, [illegible] James / 2nd Jean Bruce, Alice Goss, Jean McDonald, Annabelle Johnson, Cyril Ridal, Howard McDaniel, Gilbert Laird, Harry [illegible], Robert Beck, [illegible] Gray,/ 3rd, Terry Kirkpatrick, Sheila McAdam, Lillian Chapman, Lorna Greenwood, Iris Daxbury, Mary Tait, Kathleen Westley, Sabine Stibbs, Margaret Hawthorne, Grace Sutherland / 4th Buddy McCann, Billy Robertson, Stanley Long, Buddy [illegible] Gordon Blanchard"